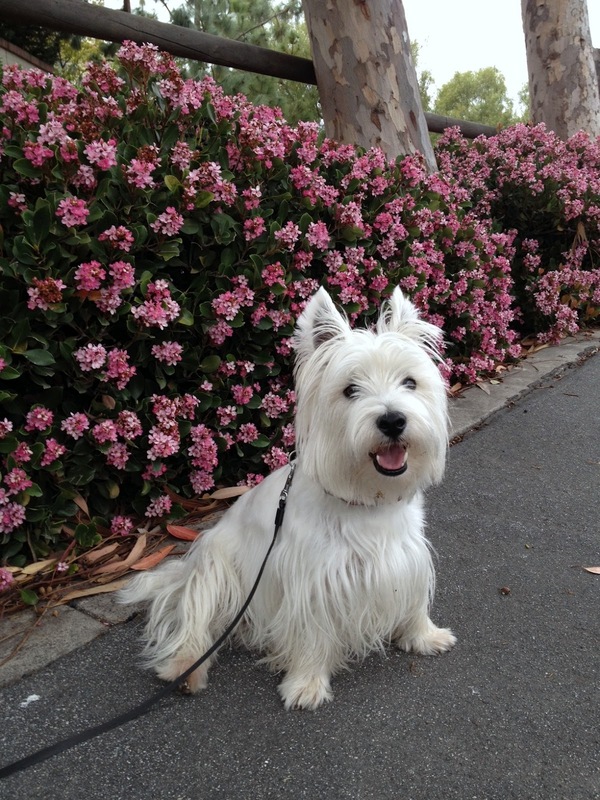 The White Dog Blog: Well, hello Springtime!!! Oh dear, the Westie itchy paws problem. Gail knows all about that from her last dog Hamish. We do hope your mom and dad can find something to make you feel better. But the flowers are pretty. Hi Duncan, we read somewhere that eating chicken can cause food allergies manifesting itself in "paw licking" - have you checked that out? My, but don't you look mighty handsome sitting there in front of those blooms. Hope you solve the itchy feet problem. Oh, no .... could it be the chicken?????? I eat alot of that. WOW, thanks for the heads up!!!! Pretty picture, good looking blooms but you set them off. Don't have to many things here to start problems, except cotton wood trees, ugh, hate that stuff. Oh, allergies can get bad so I hope yours aren't too bad. What a beautiful picture with you posing with the pretty pink flowers, Duncan! I hope they find something to help with the itchies. Sorry the spring season is not friendly with you all! Sorry that Spring isnt to good to you. The flowers are soooo pretty! !